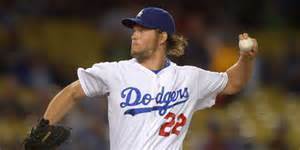 Dodgers’ Ace Clayton Kershaw earned his 15th win of the season as LA defeated the D-backs 6-3. LA Dodgers’ Ace Clayton Kershaw (ERA 2.25) earned his fifteenth win of the season in a 6-3 victory against the and although he got the win, it wasn’t the type of performance that Dodger fans and Kershaw himself are used to seeing from the three time Cy Young Award Winner. Kershaw worked just five innings on Thursday afternoon allowing six hits and three runs by the D-backs, putting the Dodgers in a three run hole. Kershaw showed that he wasn’t pleased with the decision with anger in the dugout after being taken out. But, in the bottom of the inning, Howie Kendrick hit a two run single to cut the deficit to one run for a 3-2 ballgame. After Scott Van Slyke struck out, A.J. Ellis walked to lead the bases once again. Chris Heisey however, then saved the day with a grand slam to left field to make it a 6-3 ballgame and get Kershaw the win. On the other side it was lefty Patrick Corbin (ERA 3.28) who had the start and although he sailed through four innings, the Dodgers rally ended his day after just four and one third innings, as he was charged with the the loss after allowing five hits and four runs; walking three and striking out three.